Three hours after I finished a long lunch, I'm back at the dinner table with The Man in White T-shirt and a group of friends. 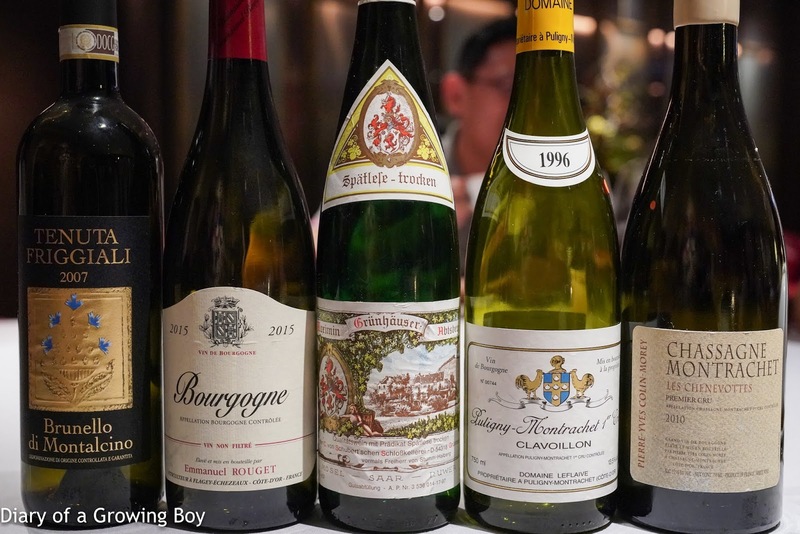 Earlier this year I had thoroughly enjoyed my first dinner at Xin Rong Ji (新榮記), although that was with special arrangements by the owner and ultimately the whole thing was comped - including 2 bottles of expensive Burgundy. To get a sense of what the cuisine is really like for ordinary diners, I decided to round up a few of the usual suspects and booked us a table in the main dining room. 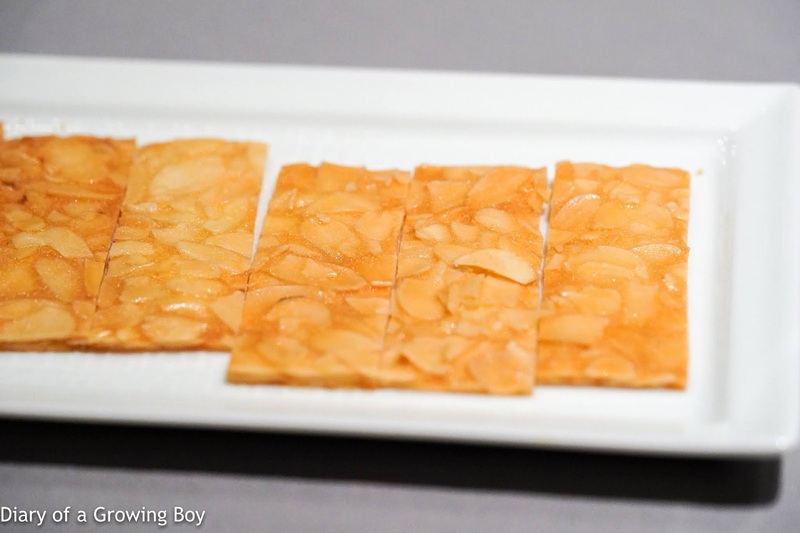 Almond wafers (杏仁酥片) - this was one of the amuse bouches. The other was a big bunch of grapes. 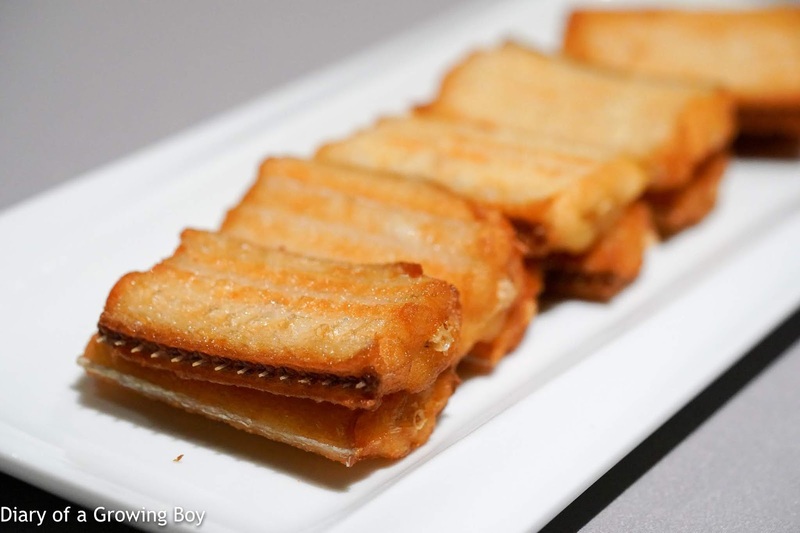 Crispy fried silver ribbon fish (黃金脆帶魚) - not as good as what we had last time. Soft and mushy tonight on the inside. 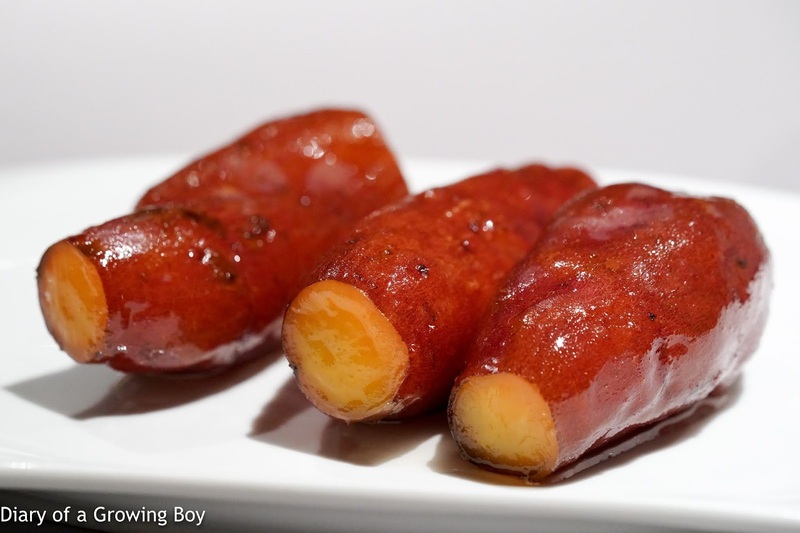 Honey glazed sweet potatoes (蜜汁紅薯) - as we did not pre-order dishes, we didn't get the beautiful potatoes which I enjoyed so much last time. These were pretty decent, though. 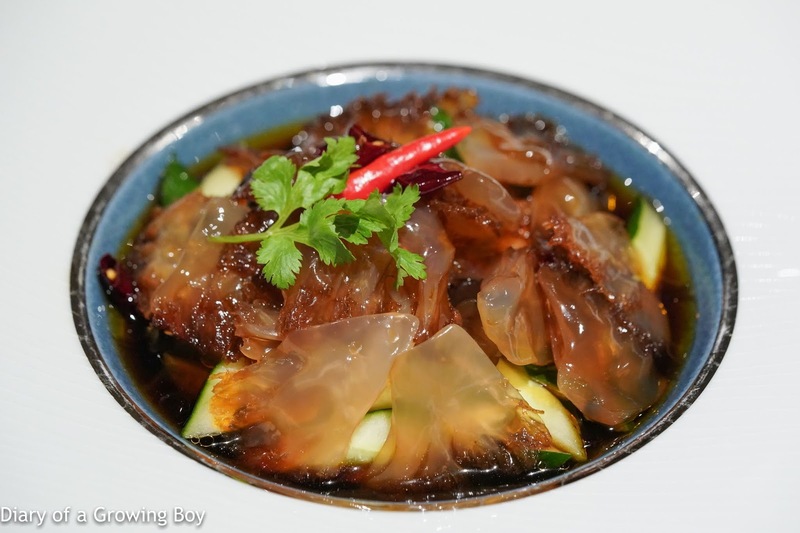 Jelly fish tossed with homemade sauce (撈汁海蟄) - this seemed to have a lot more sauce tonight, but at the same time the flavors from the marinade didn't seem to get into the jellyfish as much. 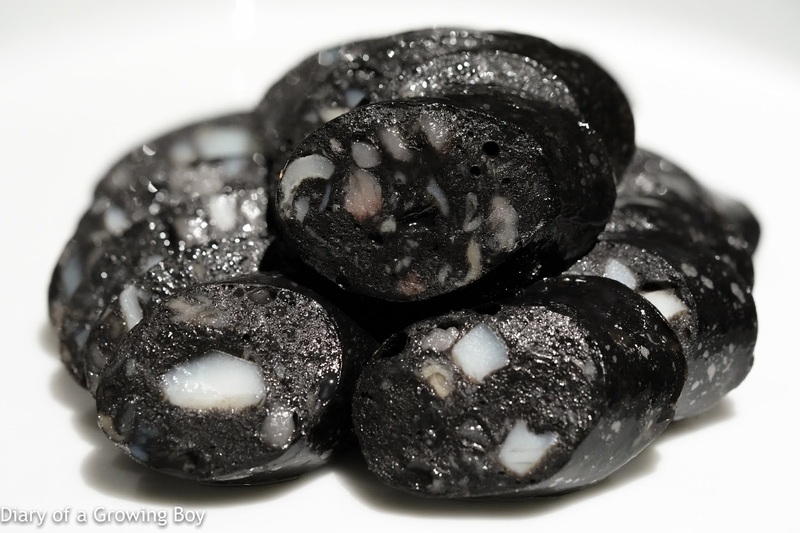 Cuttlefish sausage (墨魚香腸) - nice and delicious with spices and pepper flavors. 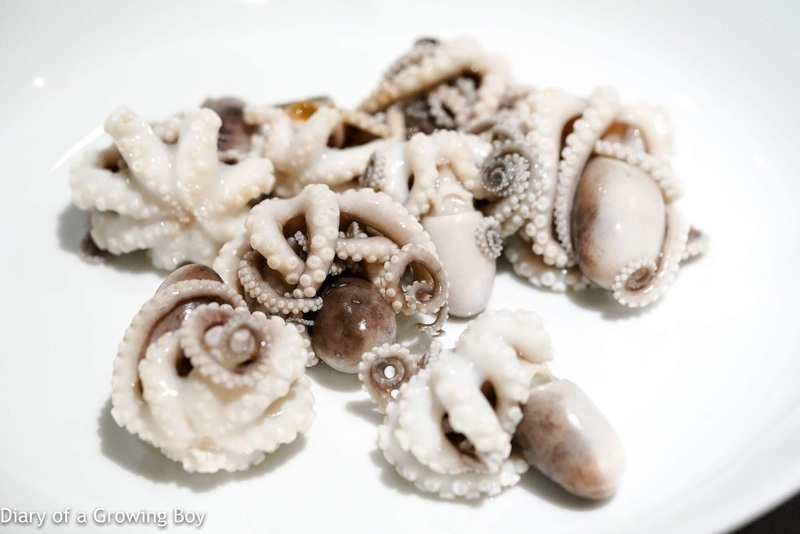 Fresh baby octopus cooked with preserved vegetables (酸菜煮望潮) - these tender baby octopi apparently come from the East China Sea, and offered per piece. 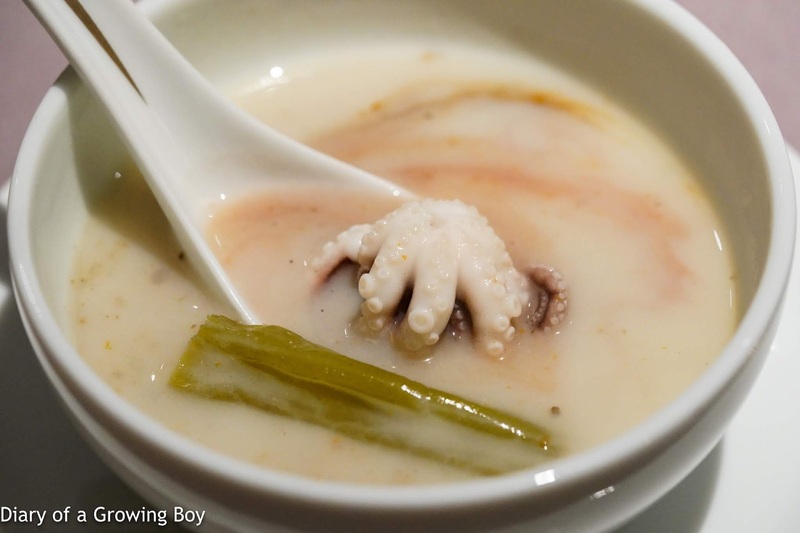 The thick and milky soup was pretty delicious with a swirl of black vinegar and sprinkle of white pepper. 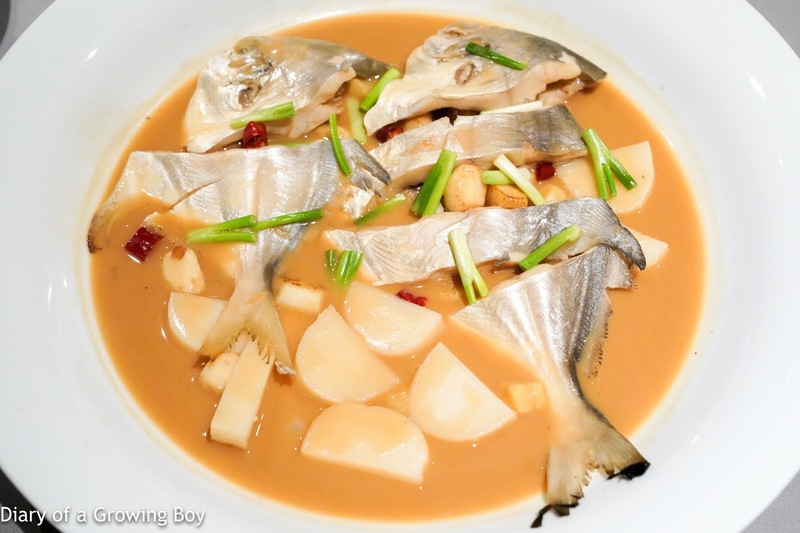 Rich soup stock braised pomfert with rice cakes (家燒鯧魚配年糕) - one of my favorite dishes from the last visit. This just reminds me of the way mom used to cook fish at home... that light-brown, milky-looking sauce. Fresh and tender pomfrets caught in the East China Sea, along with a few chewy rice cakes. 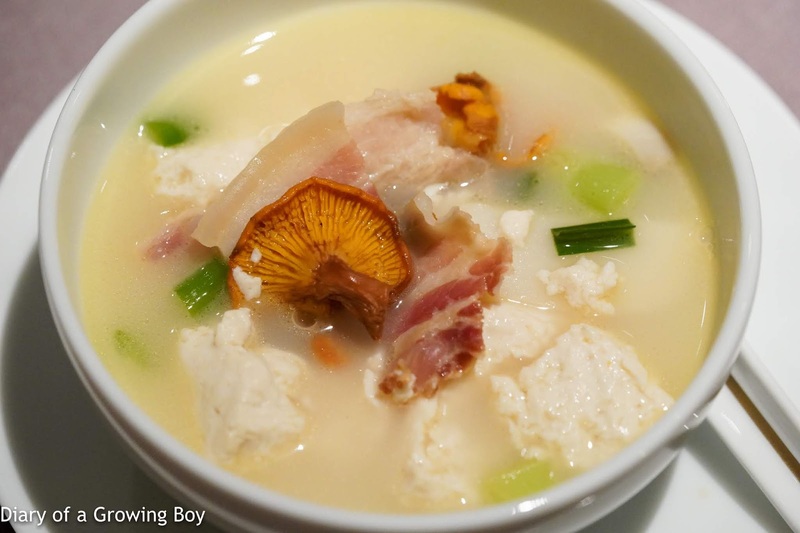 Braised tofu with chanterelles in rich soup (雞油菌鹽滷豆腐) - the tofu was as fantastic as always, packing so much intense and almost smoky, fermented flavors. With chanterelles, bacon, button mushrooms, bamboo shoots, and large dried shrimps. 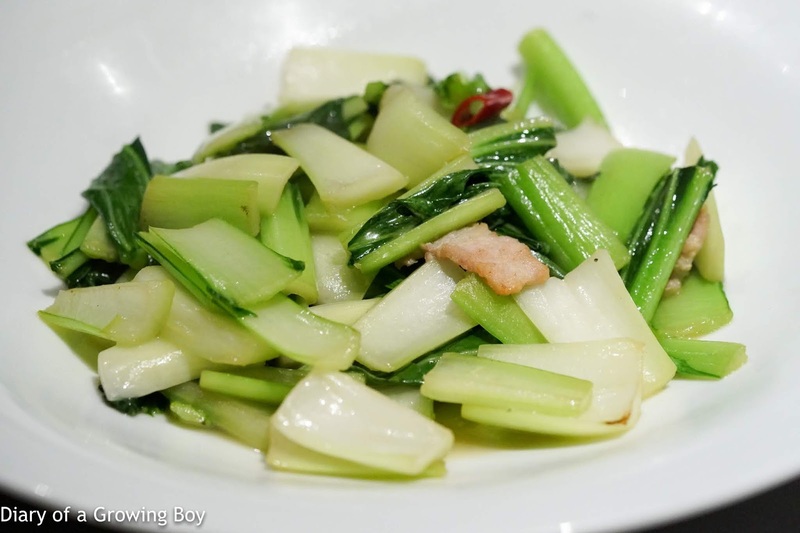 Stir-fried seasonal green vegetables (家燒時蔬) - with slices of bacon. 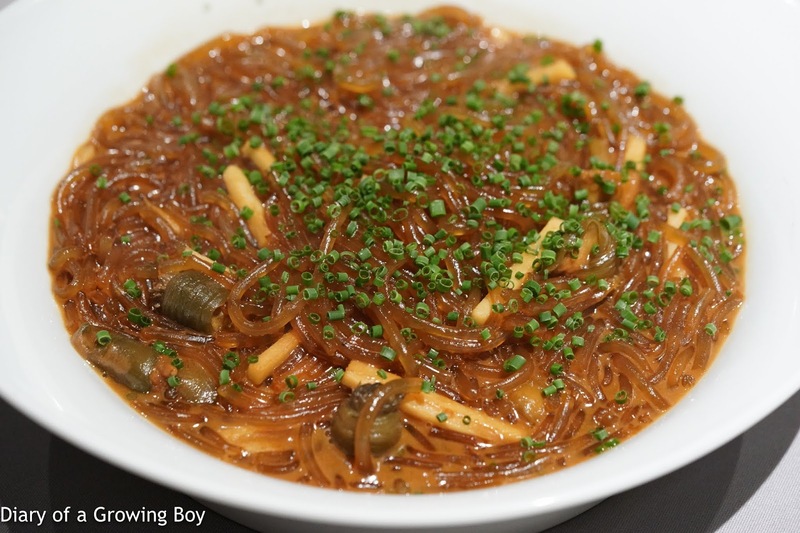 Braised sea anemones with sweet potato noodles (沙蒜豆麵) - I loved the glass noodles and the delicious and rich sauce last time, but tonight once again I found the sea anemones to be a little strong and fishy. 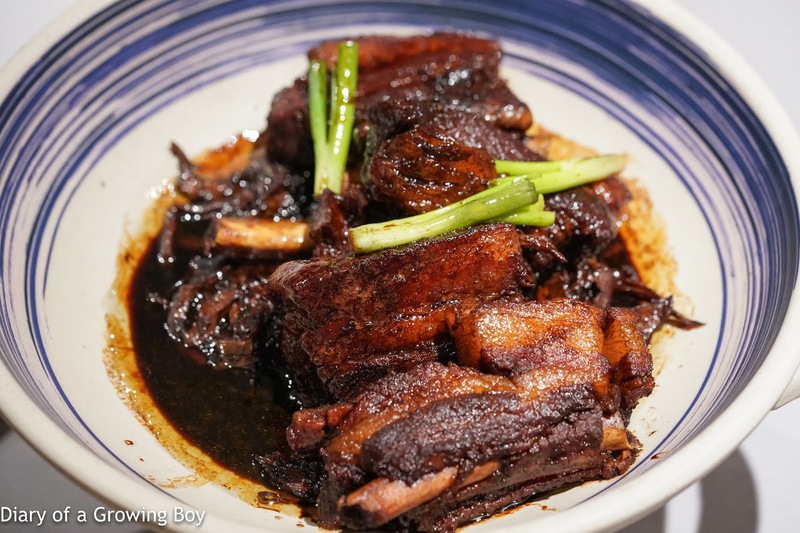 Stewed ribs of black hog (原味黑毛豬子排) - what's not to love about fatty pork ribs?! 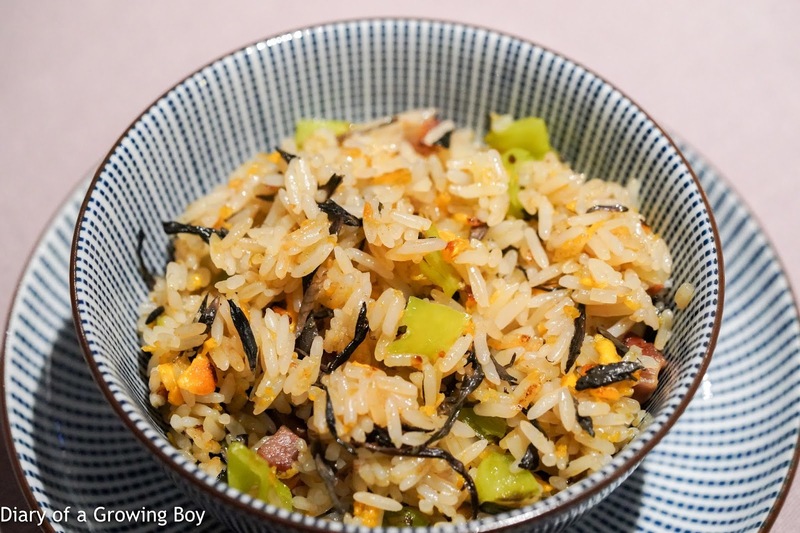 Fried rice with pork and ganbajun (乾巴菌炒飯) - this was some piece of work! The captain came and basically cooked this tableside for us from scratch, and the smell became more and more alluring as time went on. And this bowl was fantastic. The rice grains had just the right amount of chewiness and consistency. The diced green chili peppers, the smoky and salted pork, and of course the ganbajun (乾巴菌) mushroom just made the dish. I wish I had room more another bowl or three. 2010 Pierre-Yves Colin-Morey Chassagne-Montrachet 1er Cru Chenevottes - pretty ripe and buttery, with a little toast. 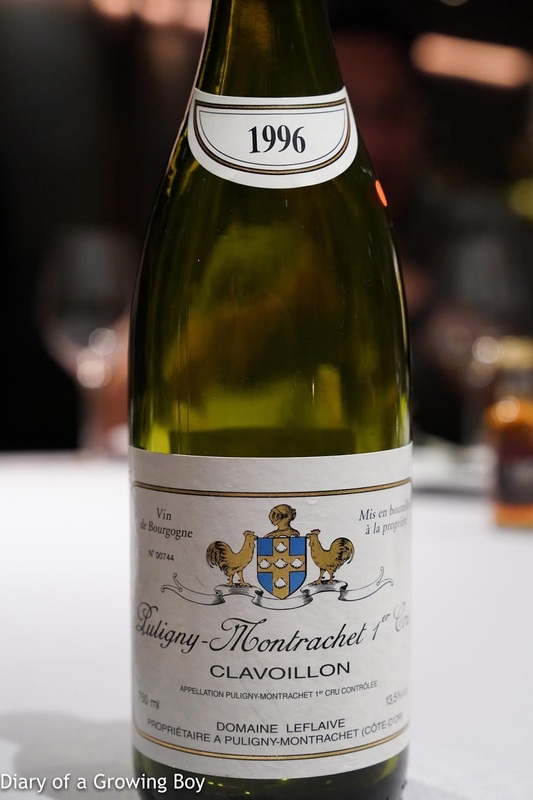 1996 Domaine Leflaive Puligny-Montrachet 1er Cru Clavoillon - very toasty. Good acidity here but also some ripeness. 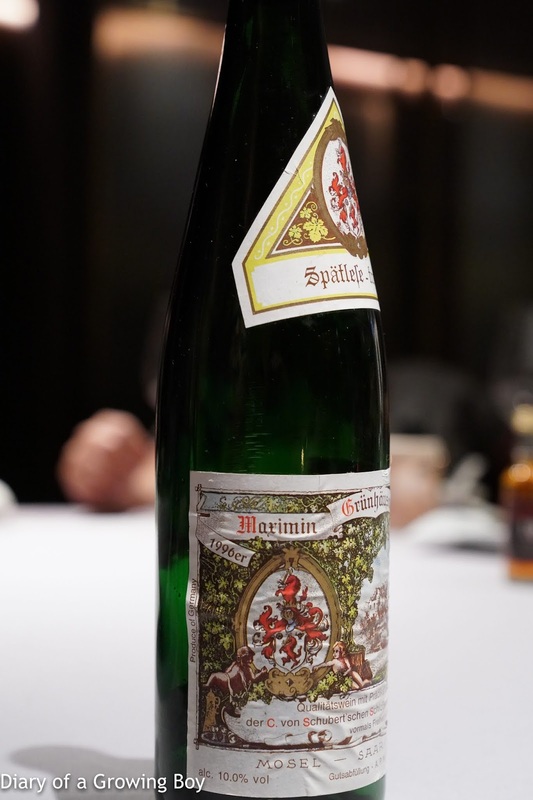 1996 von Schubert Maximin Grünhäuser Abstberg Riesling Spätlese-trocken - nose was very ripe with tons of honey and marmalade. 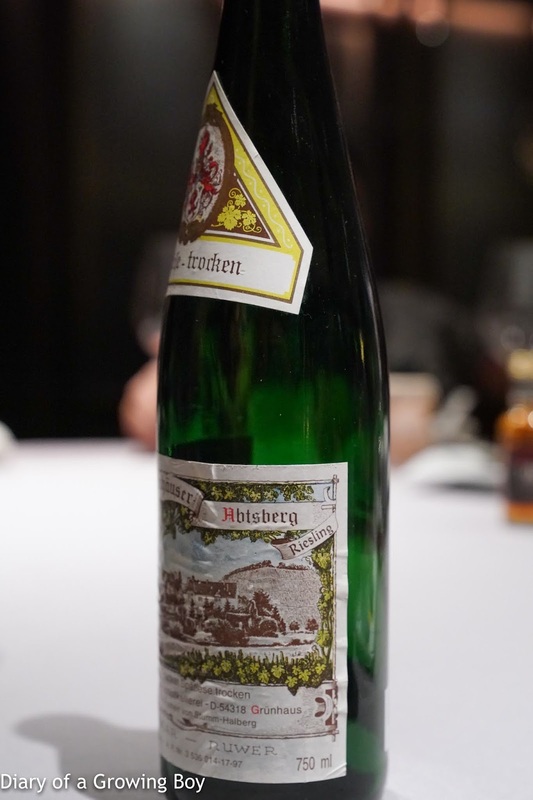 Very dry on the palate with high acidity levels, but not entirely crisp and with some ripeness. 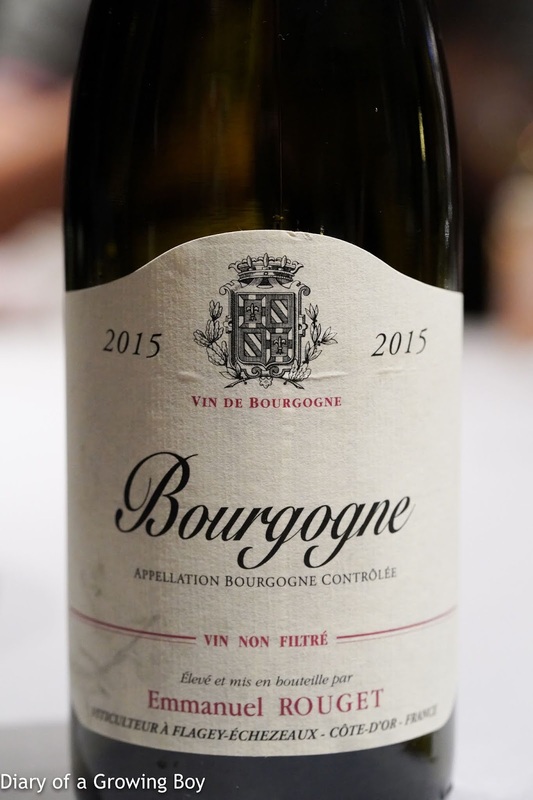 2015 Rouget Bourgogne - very fragrant, fruity with eucalyptus. Soft on the palate. 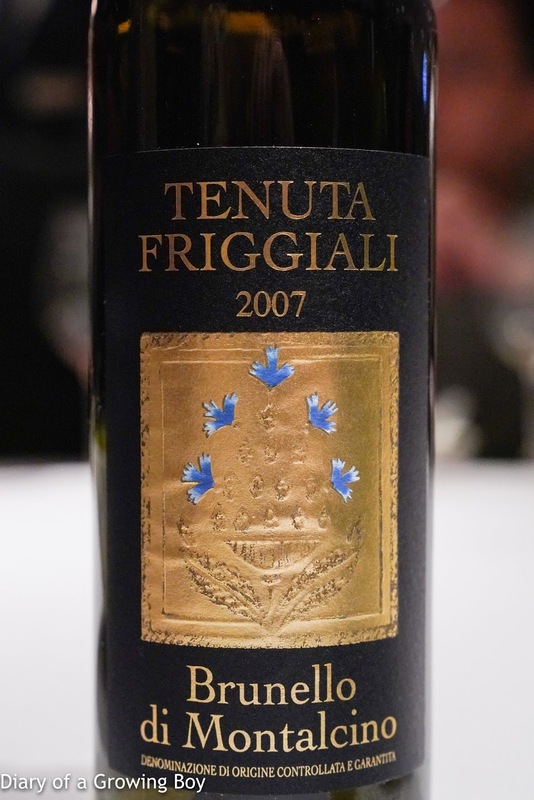 2007 Friggiali Brunello di Montalcino - a little hint of mint and herbs, with acidity on the palate. A pretty good meal, and certainly very high quality ingredients and good execution. I can see this become somewhere I come back regularly.